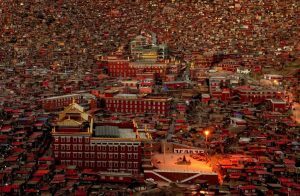 Seda Monastery, or Larung Wuming Buddhist Institute locates in Seda County of Garze Tibetan Autonomous Prefecture in Sichuan Province, China. Seda or Sertar means “golden horse” in Tibetan language because people once found horse head shaped gold in the pasture nearby. And, legends said that King Gesar’s horse once ran on the pasture, too. Thus, when you pass the bueatiful pastuer, you can still see many horses on it. Seda Monastery is about 20km from Seda County. So, you can take a car or bus to get there with very cheap fare. 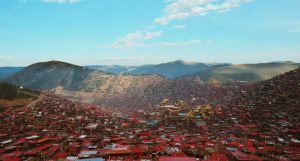 If you take a Sichuan Tibet overland tour, you can pass Seda Monastery and enjoy the religious theme tour. 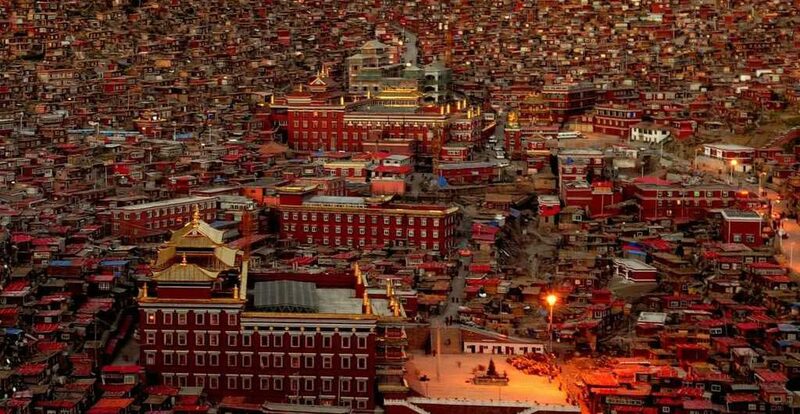 When you arrive Seda Monastery, the numerous red roof houses will astonish you absolutely. There are over ten thousand of monks and nuns live and study here. They are from all over the world. The monastery implement very strict management policies towards male and female monks. So, if you go there, please follow the rules and respect the monks’ customs. Also, if you are interested in listening to a Buddhist lecture, Seda Monastery provides you with the precious chance to have a public Buddhist class. Also, you should follow the monastery’s rule and behave yourself well when having the class. Standing on the top of mountains, you cannot miss the overall view of Seda Monastery. Especially at night, the starry lights from thousands of monks’ houses will remind you of the peaceful life different from the noisy busy world. The devoutness of monks and nuns are so impressive because the living condition is poor with harsh natural environment. 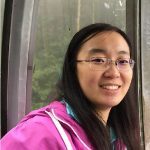 Moreover, they need to study very hard to pass the exams. Another famous site is sky burial platform near Seda Monastery. You can see the solemn process only in far distance. 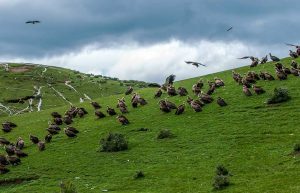 For Tibetan people, the sky burial ritual is very important, so when you watch, please respect their customs and do not take photos without permission. Jigme Phuntsok founded Seda Monastery in 1980. Jigme Phuntsok was a very influential Nyingmapa lama at that time. He focused on teaching Dzogchen (Great Perfection) and made great achievements. Initially, there were only 32 people when Seda Monastery was established in 1980. After that, the 10th Panchen agreed to set up a Buddhist Institute in Seda County and wrote to the local government for support. In 1993, the Director of Chinese Buddhist Association wrote the name the monastery as “Seda Larung Wuming Buddhist Institute”. In the same year, the World Journal called it “the largest Buddhist Institute” in the world. Seda County is about 650km northwest from Chengdu. So, you can take the direct bus from Chadianzi Bus Terminal in Chengdu which takes around 13 hours. It departs at 6:20 am and you will get there at 8:00 pm. Or you can take the bus to Barkam or Kangding for one night stay and head to Seda County the next morning. In this way, you will feel less tired than one whole day bus trip. Moreover, there are many buses between Chengdu and Barkam or Kangding. There are many choices for accommodation in Seda County. You can choose hotels or youth hostels. Many guests speak highly of accommodation in Seda County. They say there are free wi-fi, 24-hours hot water, heater and electronic blanket in most hotels. Thus, it is very comfortable staying there. If you stay in Seda Monastery, the living condition is not as good as hotels in Seda County. Also, the choices are very limited. The elevation of Seda Monastery is above 4,000 meters. Thus, you should take some warm clothes and prepare some AMS medicine for emergency. Moreover, in January, April, June and September, there will hold Dharma Assembly. So, if you plan to go to Seda Monastery in those months, you should book the bus tickets and hotels in advance. For more Tibet Buddhism or Tibet travel news, please follow our Tibet Travel Blog. We will update every day to provide the most readable Tibet travel articles for you.